#TeamSCG – Live Coverage of Team StarCityGames.com at Pro Tour Dragon's Maze! Live Coverage of Team StarCityGames.com at Pro Tour Dragon's Maze! The final round saw Team SCG return to their winning ways, for the most part. Patrick Chapin took an ID into Top 50, while Nassif did the same in order to secure Top 16. 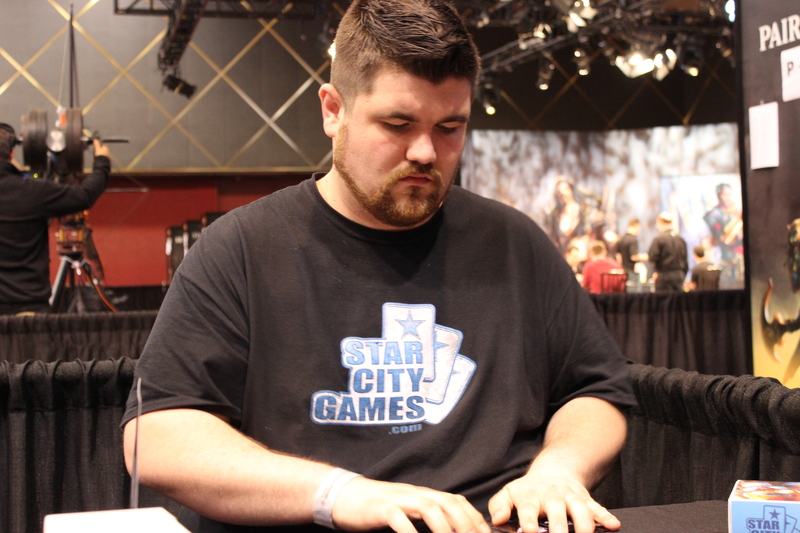 Tom Martell won playing for Top 16, a pretty strong following to his Pro Tour Gatecrash performance. The big story of the round was Reid Duke. Reid could draw into Platinum for the next year, but a win would also send him to the Player’s Championship and give him a significant cash boost… but a loss would mean Gold. On the live camera he dueled for all those marbles, and came up a winner! The player to watch is Gabriel Nassif. His match against Ken Yukuhiro was quite the affair but two topdecked copies of Angel of Serenity (one from a cycled Azorious Charm and the other from the final activation from a Jace, Architect of Thought) allowed Nassif to not only claw his way back into the match but actually win it. ON THE FOURTH TURN OF EXTRA TURNS! Now he stands one win away and some interesting tiebreaker math breaking in his favor between his tenth Pro Tour top eight. He’s paired against David Sharfman for the final round of the day, who’s San Diego Zoo deck has taken this tournament by storm and may wind up as the constructed deck with the highest win percentage. Can Nassif defeat the Pro Tour: Nagoya champion and add another Sunday to his vast list of accomplishments? We’ll know shortly! This round saw the bell toll a few times. Team SCG’s Top 8 hopes are basically dashed at this point, but there’s still plenty on the line. Reid Duke, for example, is hunting for Platinum with a Top 25 finish, while Tom Martell is holding on for dear life to retain captaincy of the US World Magic Cup team. Only a couple more rounds are left before it’s all settled. As you now well know, many members of Team SCG are playing Bant Control. What you might not know is that all of them are! For the first time, all 17 players are locked in on the same archetype at the Pro Tour. So how did they land on this particular archetype? I sat down with Brad Nelson to figure it out. “Testing started with everyone in ‘free play,’” Brad explained. “Zvi on a Zvi deck and Sam on a Sam deck. I started as ‘the enemy’ and I liked where the Sphinx’s Revelation decks were.” The mythic rare is one of the defining cards in San Diego, so that’s no real surprise. Their brews sounded far more interesting! “Zvi worked on a Dark Simic deck and Sam on Hidden Strings combo. They were cool decks, but there wasn’t enough time and the metagame punishes inconsistent decks.” Looking around, the success of G/B/W disruptive decks and the Florida G/R/W certainly echo that sentiment. Brad moved on from the deck, abandoning it when he failed to get that matchup up to snuff. “I saw an old shell of a Bant deck from RTR-GTC Block, and ported it over. I cut all the bad cards and added Voices.” The 2/2 changed the game significantly. “The thing Bant does is have the best Jaces in the format. We can protect our Jaces and defeat theirs—Voice and Smiter force their Jaces to tick up or die, and ticking up is the worst thing to do in the control mirror.” That gave Team SCG the room to lean on the card advantage of Jace, while their Esper opponents were on the back foot. Voice didn’t stop there. “Against aggressive decks, you can throw out guys and tick down Jace safely. It puts them in an awkward spot where they often have to decide between attacking you or Jace.” With a potent two-drop, Bant started to look sweet. “Bant plays a really good game starting on turn 2. If aggressive decks stumble, you can be aggressive. Supreme Verdict isn’t the end-all, be-all—you have to interact with them before that.” Now, Bant could—it didn’t have to worry about Rootborn Defenses, Golgari Charm, or Boros Charm ‘countering’ Supreme Verdicts. It could just play Voices and Smiters to match their game. A turn 5 Aetherling with mana up is nearly impossible to defeat in the format. “Once Chapin and Duke were on this deck, the correct shell got built and the deck was unbeatable,” Brad admitted. The team went to work honing the numbers, cutting the chaff, and arrived at the configuration that is serving them so well. Overall, Team SCG’s Bant Control deck did about 60% on Day 1, a fine rate across 17 players. Only Gabriel Nassif went undefeated, with five players behind him on four wins. Gabriel Nassif and Patrick Chapin had to battle last round with Nassif coming out on top to keep his top eight dreams alive. Reid Duke also kept his top eight aspirations in tact by finding an end to Hao-Shan Huang’s overly complicated maze. The rest of the team looks to be out of top eight contention but with plenty of pro points and cash on the line, I expect to see quite a few awesome matches over the next three rounds. The team managed a full split this round, but with the losses coming in some key matches. Reid Duke and Tom Martell were paired, resulting in only one of them advancing ahead on three losses. Patrick Chapin and Gabriel Nassif both dropped their matches, falling to three losses and leaving the Top 8 in a much cloudier situation for the Team. It’s not #PTGTC in San Diego, but with three rounds to go there’s still plenty of glory (and cash and Pro Points) left up for grabs. Chapin and Nassif lead the pack at 9-2 and are incredibly happy moving back to constructed. Nassif, in particular, has not lost a game with #TeamSCG’s take on Bant this weekend. Martell and Duke both sit at 8-3, but are coming off very different experiences in round eleven. Martell won an incredibly tense game three with some timely topdecks to keep his top eight dreams alive while Duke lost an uneventful game three to Pro Tour: Nagoya champion David Sharfman to slow down his fantastic start. Another player who has slowed down dramatically is Bob Maher. Entering the day at 6-1-1 and very pleased with how his draft went, Maher lost all three of his matches to wind up 6-4-1 and out of top eight contention. Things really can change that dramatically in just three hours. As the players enjoy their lunch break, it will be fun to chat with them about their state of mind moving forward. These last five rounds are pressure filled and seeing how they handle it will be the difference between a top 50, a top 25, or a top 8. Be sure to follow us on Twitter (@Starcitygames) as we bring you up to the minute action on all of the matches taking place! It’s been fun so far and it’s only about to get better!